Kamala Harris action figure; Image via fctry.com. Kamala Harris action figures now join the other political figures such as Obama and Sanders. It’s just the start of the run-up to 2020 presidential elections and things are already beginning to look interesting. When the junior senator from California Kamala Harris announced her run, there was bound to be interest both because of her putative career in law and also because of her diversity— she is the nation’s first Indian American senator and the first African American female senator. 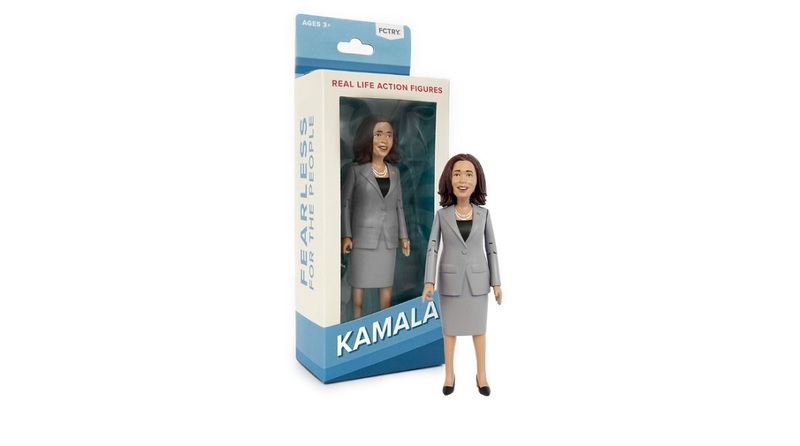 But besides a volley of supporters in less than a week, Sen. Harris has also inspired an action figure doll! FCTRY, a Brooklyn based manufacturer, has just released a Kamala Harris action figure. The latest mini-me joins other political figures such as special counsel Robert Mueller and another 2020 presidential contender Massachusetts Sen. Elizabeth Warren. The company has also in the past made figurines of former President Barack Obama and Sen. Bernie Sanders. And if you are missing Trump in this camp, then well, there is an Evil Trump figure to choose from. The six-inch tall Kamala action figures are priced at $19.99, and are available now on the company website for pre-order. But keep in mind it won’t arrive before the Spring of 2019; which actually can be the perfect time as the political scene is likely to get more charged up by the time winter wanes!